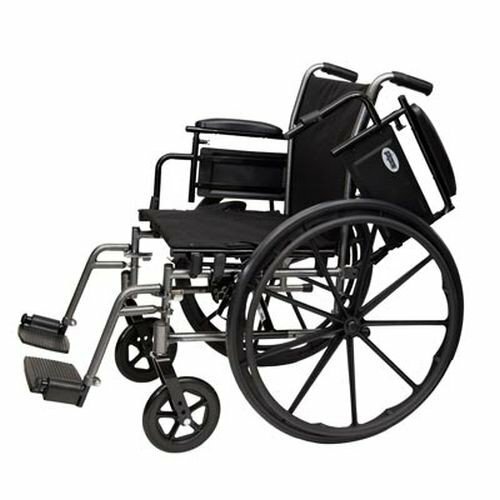 Probasics Lightweight Wheelchair is a piece of mobility equipment that features a sleek black finish and an adjustable seat-to-floor height of 18 inches to 20 inches to allow for easy conversion to hemi-height. This Probasics wheelchair is equipped with the option of either swingaway footrests or elevating legrests depending on user preference. Probasics Lightweight Wheelchair has desk-length height adjustable arms and a 300 lb. weight capacity to create a piece of mobility equipment that's suitable for everyday use. Sleek, sturdy and lightweight, this Probasics wheelchair is a comfortable solution for anybody seeking a lightweight and stylish wheelchair for everyday use. You may also be interested in similar pieces of lightweight mobility equipment, such as Economy High Performance Lightweight Wheelchair. Features a sleek black finish and an adjustable seat-to-floor height of 18 inches to 20 inches to allow for an easy conversion to hemi-height. Equipped with the option of either swingaway footrests or elevating legrests. Flip-back desk-length height adjustable arms. 300 lb. weight capacity makes this wheelchair ideal for everyday use. Shipping Weight: 48 lbs, 52 lbs.